Three life-long horse lovers, sisters Kelle Lerch and Katie Fitzpatrick, and their mother, Peri Fitzpatrick, manage ﻿Vintage Oaks Horse Farm. Kelle grew up in the horse business, and learned from one of the best teachers in the field, her mother Peri Fitzpatrick. Breeding, training and showing horses were always a part of Kelle’s life and now she’s sharing that knowledge and love with an entirely new generation of riders. High Spirits and Everlasting Times were homebred large ponies sold into major A circuit barns. Everlasting Times was renamed Me and My Shadow and was declared Reserve Champion Large Green Pony at Pony Finals the year she was sold. As a teenager Kelle worked with several project horses that were shown locally and sold or leased. In 2001 Kelle attended East Carolina University and occasionally rode at a local show barn. During her visits home, she would jump at the chance to ride. In 2003 Kelle transferred to Towson University and changed her major to business administration with a concentration in marketing. After graduation she worked at T. Rowe Price and started showing locally. In the fall of 2009, Kelle was offered the opportunity to manage Vintage Oaks Horse Farm and bring focus and direction to the operation. She started the training and sales operation and has built it into a thriving, well-known horse farm. Like her sister, Katie grew up riding with her mother, Peri, and started showing horses at the age of two. In addition, she catch rode numerous ponies for several local trainers and at the age of 14, she became interested in carriage driving, which led to the purchase of a yearling miniature horse named Baby. During her high school years, Katie rode several horses that had been initially taken care of by her sister Kelle. 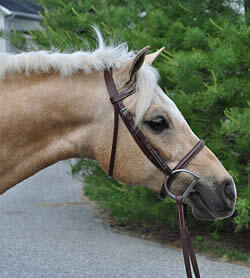 At the age of 16, she began riding an awesome, yet challenging, Dutch Warmblood named One Way Or The Other. Her time aboard One Way Or The Other led Katie to learning the Parelli Method of Natural Horsemanship. After showing a year in the Children's Hunters, the pair stepped up to the BigEq classes. Although she only had limited showing experience, Katie finished her junior career with much success. Lincoln Russell (hunter, jumpers, sales). Katie spends her summers breaking and training ponies for her mom and continues to breed, raise, train, and show miniature horses locally and nationally. Her first trip to nationals brought home three national top tens and one national top three. Katie currently has several homebred horses and ponies that she is starting to break, train, and sell for herself, in addition to training at both Vintage Oaks Farm and High Hopes Ridge Farm. Peri was born & raised in Baltimore. Member and competitor of MHSA & USEF since the late 70’s. Local Judge, Owner, Breeder, Trainer & Handler of numerous Devon Winners. Just to name a few…. Raised & competed many on a local level to hundreds of year end Championships ranging from Short Stirrup to Junior Hunter. Served on the BCHSA board for over 25 years and managed the BCHSA Medal Finals for 20 years. The most rewarding part of what I do is to coach & mentor a young riders. I love to see that individual successfully through their Junior years into college & then have them return years later with children of their own. Proud to say that 7 of my students have graduated from Vet School, over a dozen went on to Jr. National Champions in Polo and numerous have chosen a professional career from the Gran Prix Ring to Equine Therapy. MY biggest success though is my daughters, we all have our unique style and we love children, so it has been wonderful to work along side them.